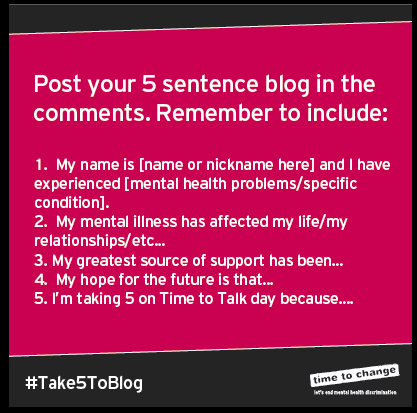 Seeing that it’s Time to Talk day, I decided to take part in the #Take5ToBlog. It’s where there’s 5 questions from your name, your illness to your hopes for the future. I found this though a Facebook post and also a email I was sent and I just had to take part so I could do my part to raise awareness of mental health and the issues around it. Now I’m fairly open about my mental health (as you would see from my twitter and also this blog) but this is slightly different. My name is: Fox (like I’ll give my real name on here) and I have experienced a variety of mental health problems to name a few: Bipolar, anorexia, anxiety, OCD and also PTSD. My mental illnesses have affected every part of my life: being awake, sleeping, work ect. The crushing lows and highs of bipolar have impacted so much of my life from self care, friends, personal relationships and also work. Anorexia also affects every waking moment, living with the fear of food and the fear of gaining weight, having a voice where it makes you believe that you are fat, the guilt after eating something, the impulse to exercise all the time to lose weight. The anxiety is another one; the fear of being in a crowded place, speaking to people who I don’t know or being in a different place, this affects me to the point where I’ll have panic attacks, bolt away or worse case… I just shut down. My greatest source of support has come from my closest friends who have been so understanding over the years and stuck by me even when I’ve been at my lowest and was sectioned. Also my girlfriend has been fantastic at supporting me, understanding how I may act or react to something and being very resuring when something happens. My hope for the future is two things. The first one is to get back to the point where I was a few years ago where I was stable and not in the depths of my eating disorder. The 2nd is that mental health can be discussed openly and not hidden away as a shameful seciart. I’m taking 5 on time to talk day because it’s important to talk about mental health and to raise awareness of the issues surrounding it. Now I’ve done mine, are you going to do yours? Or take 5 minutes to talk to someone? It can be just a simple hello and how are you doing.